A Fever You Can't Sweat Out is the debut studio album by American rock band Panic! at the Disco. Produced by Matt Squire, the album was released on September 27, 2005, on Decaydance and Fueled by Ramen. The group formed in Las Vegas in 2004 and began posting demos online, which caught the attention of Fall Out Boy bassist Pete Wentz. Wentz signed the group to his own imprint label, Decaydance, without them having ever performed live. It is the only album released during original bassist Brent Wilson's time in the band, but the exact nature of his involvement in the writing and recording process became a source of contention upon his dismissal from the group in mid-2006. "But It's Better If You Do"
"Lying Is the Most Fun a Girl Can Have Without Taking Her Clothes Off"
"Build God, Then We'll Talk"
The album was recorded on a small budget at SOMD! Studios in College Park, Maryland over several weeks in June 2005. The group had only graduated from high school one month before. With lyrics written by lead guitarist/backing vocalist Ryan Ross, the record covers social issues and topics such as sanctity of marriage, adultery, mental health, alcoholism and prostitution are woven throughout the album. The album is divided into halves stylistically; the first half is primarily pop punk with elements of electronic, while the second employs more traditional instrumentation, with influences of baroque pop. Upon its release, A Fever You Can't Sweat Out became a commercial success. Its second single, "I Write Sins Not Tragedies", became a top 10 hit in the United States. It helped bolster sales to 1.8 million in the US by 2011, making it the group's best-selling release. Despite its sales, the album polarized music critics, with many praising the album's catchiness and others questioning its originality. The band promoted the record with stints on the Nintendo Fusion Tour before its first headlining tour, the Nothing Rhymes With Circus Tour. In late 2015, its certification was upgraded to RIAA double platinum for 2 million shipments. The band was formed in 2004, at this time named Pet Salamander, in the suburban area of Summerlin, Las Vegas, by childhood friends Ryan Ross on guitar and Spencer Smith on drums. Both teens attended Bishop Gorman High School and they began playing music together in ninth grade. They invited their friend Brent Wilson from nearby Palo Verde High School to join on bass guitar, and Wilson invited his classmate Brendon Urie to try out on guitar. They soon began rehearsing in Smith's grandmother's living room. Urie grew up in a Mormon family in Las Vegas and early on skipped rehearsals to go to church. Ross initially was the lead vocalist for the group, but on hearing Urie singing backing vocals during an early rehearsal, they unanimously decided to move him to lead. They initially worked purely as a Blink-182 cover band. The monotonous nature of local Las Vegas bands influenced them to be different and creative, and they soon began recording experimental demos. Ross and Urie soon began to record on their laptops the demos they had been developing and posted three early demos ("Time to Dance", "Nails for Breakfast, Tacks for Snacks" and "Camisado") on PureVolume. On a whim, they sent a link to Fall Out Boy bass guitarist Pete Wentz via a LiveJournal account, and around this time they changed the name of the band to Panic at the Disco. Wentz, who was in Los Angeles at the time with the rest of Fall Out Boy working on their first major-label album, From Under the Cork Tree, drove to Las Vegas to meet the band. On hearing "two to three" songs during band practice, Wentz was impressed and immediately wanted the band to sign to his Fueled by Ramen imprint label Decaydance Records, which made them the first on the new label, which the group did around December 2004. Around this time they had put an exclamation point at the end of Panic as a joke, and as they said in an interview years later, it stuck with them and became the official name of the band. As news broke that Wentz had signed Panic! (who had yet to perform a single live show), fans on the Internet began to criticize the group. Meanwhile, Wentz began to publicize the band wherever possible, from wearing "Panic! at the Disco" T-shirts onstage to mentioning them in interviews. Wentz gave a quick mention to the band during a press junket on the day before the 2005 MTV Video Music Awards: "I've got a couple of bands coming out soon on Decaydance, one being this band called Panic! at the Disco," Wentz said. "Their record is going to be your next favorite record. It's called A Fever You Can't Sweat Out — get it before your little brother does." At the time of their signing, all of the band members were still in high school, with the exception of Ross, who was forced to leave the University of Nevada, Las Vegas. After completing high school, the group members boarded a van and drove from Las Vegas to College Park, Maryland to record the album. Fueled by Ramen wanted the band to go into the studio earlier in the year, but Ross was attending college at UNLV and the others were still in high school. Urie graduated in May 2005 and the band pushed recording back to June; Smith and Wilson completed school online during production. They picked producer Matt Squire based on his production on several independent albums the group liked. The label had hoped they would pick Mike Green, who had worked with Paramore on All We Know Is Falling. "I think Crush Management and Fueled by Ramen were like, 'Who is this dude?'" said Squire. A Fever You Can't Sweat Out was created in only "three and a half weeks" — including mixing and mastering — on a budget of $11,000. The group entered the studio with half of the songs completed; the others were crafted in pre-production. Recording was stressful. "We were in the studio for 14 hours a day for five weeks; we might have started losing our minds a little bit," Ross recalled humorously in a 2006 interview. The band lived in a one-bedroom basement studio apartment during the production, with all sleeping in bunk beds. "Everyone got on everybody's nerves," said Ross. "Someone would write a new part for a song and someone else would say they didn't like it just because you ate their cereal that morning." Urie's voice was blown after tracking the album. Squire remembered that most of the album's choruses and high harmonies were recorded in one session. By the end of production, the band had not had a day off and were exhausted. After its completion, "We had two weeks to come home and learn how to be a band," Ross said. "Every song that we wrote for the first album made it. We didn’t think about writing a bunch of songs and picking the best ones. We had to just make the best songs we ever wrote." "A Fever You Can't Sweat Out" has been described as pop punk, emo, emo pop, electropunk, dance-punk, baroque pop, and alternative rock. The album is split in two stylistically, with the first half of the record using electronic instruments such as synthesizers and drum machines while the second employs traditional instruments such as the accordion and organ. They are separated by an intermission as a link between the two halves, beginning with techno-style dance beats before switching to a piano interlude. Squire recalled that the band had an "identity crisis" upon writing new songs. The more dance-infused tracks were crafted during the group's time in Vegas, but the band members found themselves writing more straightforward rock tracks when they entered the studio. The band did not want to include the rock songs, but Squire got them to agree to it one day over lunch. "I took them out to lunch and said, "Why don’t we tell the story of that creative evolution as the theme of the album? '", he later recalled. "London Beckoned Songs About Money Written by Machines"
"London Beckoned Songs About Money Written by Machines" takes a preliminary aim at webzines' criticism. 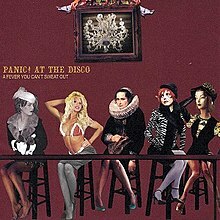 The ambitious quality of the album's content was representative of the band's desire to "do whatever we wanted," according to Urie. The band was heavily inspired by music groups Third Eye Blind, Counting Crows, Arcade Fire and the Decemberists during rehearsals, and also by Danny Elfman and Jon Brion film scores. Urie specifically cited the Beatles, Queen, the Smiths, Name Taken, and the Keane song "Everybody's Changing" as influences on the album. He remarked, "We took all of those biggest influences, listening to them from our parents and mashed them together." The album's writing is strongly influenced by Chuck Palahniuk's work. The song title "The Only Difference Between Martyrdom and Suicide Is Press Coverage" is a quote from his book Survivor. "Time to Dance" tells the story of Invisible Monsters, and includes quotes such as "Give me envy, give me malice, give me your attention". Other references and quotes can be found throughout the album, such as "Just for the record, the weather today is..." (Diary). Wentz served as an advisor to the group on lyrical content: "he was always there to help out with a line here, a line there," said Urie. The group noticed that bands in the pop punk scene, such as Fall Out Boy and Name Taken, were using long song titles. The band decided to take this a step farther, creating increasingly long titles partially as an inside joke. The song "I Constantly Thank God for Esteban" was a reference to an infomercial for Esteban Guitars the group found humorous. Sales of the album began relatively slow. It debuted at No. 112 on the Billboard 200 album chart, and later peaked at number 13. The album sold over two million copies in the United States. It spent 88 weeks on the Billboard 200. A Fever You Can't Sweat Out divided music critics at the time of its release. Billboard, ten years after its release, deemed it "one of the most polarizing albums of our time". Cory D. Byrom of Pitchfork was perhaps the most negative, criticizing the state of contemporary emo and bemoaning the album's apparent lack of "sincerity, creativity, or originality". Johnny Loftus of AllMusic was similarly negative, writing, "This is a band in love with making a record — making a statement — but there's nothing unique inside, neither in their formula nor the vaunted and sticky production." Lauren Gitlin of Rolling Stone complimented the album's sound, commenting, "What makes Panic different (and excellent) is their use of dance-floor synths and roboto drums, which redeems the album's whininess." Kerrang! was positive, awarding the record four out of five stars. Rolling Stone also gave a positive review, with three and a half stars out of five. Webzines like Gigwise and Sputnikmusic also gave positive reviews. The hit single, "I Write Sins Not Tragedies", received massive airplay and Panic! at the Disco won "Video of the Year" on the annual MTV Video Music Awards in 2006, beating fellow nominees Madonna, Christina Aguilera, Shakira and Red Hot Chili Peppers. In September 2011, "I Write Sins Not Tragedies" won MTV's Best Music Video of the 2000s as well as Best Music Video of All Time based on online voting. Rolling Stone listed it among the "40 Greatest Emo Albums of All Time" in 2016, with James Montgomery dubbing it a "genre-defying blueprint" and commenting "it's difficult to argue that it's not a snapshot of where "emo" was at in 2005, right down to the sentence-long song titles." In the fallout of Wilson's firing from the band in May 2006 due to "lack of responsibility" and "not progressing musically with the band", the remaining members also alleged that Wilson did not participate in the writing and recording of the album, with Urie and Ross writing bass parts that were simplified so that Wilson could play them live, and Urie recording them in the studio. Wilson denied their statement, insisting that he was present in the studio every day, participating in writing, and teaching Urie how to play certain parts. He also sued the band for 25% of royalties from the album's sales, as stipulated in the original contract. On November 14, 2006, the album was re-released in a "deluxe" edition (Limited Edition Collectible Deluxe Box), packaged in a cigar box-shaped box set. The box set was limited to 25,000 copies. It included the original album on CD, a live concert titled Live in Denver on DVD, picture cards for each song with lyrics printed on individual cards, 2006 tour program, poster of the band, live photo shots, a phenakistoscope, circus-styled mask, fake newspaper article and a blank notebook. The Live in Denver DVD was filmed in Denver on July 22, 2006. All lyrics written by Ryan Ross; all music composed by Ross, Brendon Urie, Spencer Smith. Credits for A Fever You Can't Sweat Out adapted from AllMusic. ^ Bazley, John (September 27, 2015). "Brendon Urie Reflects on Tenth Anniversary of Panic! at the Disco's 'A Fever You Can't Sweat Out'". Alternative Press. Archived from the original on September 27, 2015. Retrieved September 27, 2015. ^ "Billboard". Retrieved December 24, 2015. ^ "Panic! at the Disco's 'A Fever You Can't Sweat Out' Goes Double Platinum - Billboard". Billboard. Retrieved December 24, 2015. ^ a b c d e Mike Kalil (October 28, 2005). "Panic! Attacks". Las Vegas Review-Journal. Retrieved March 23, 2011. ^ "Who are Panic! at the Disco?". BBC News. September 1, 2006. Retrieved March 23, 2011. ^ Dave Simpson (June 20, 2008). "Growing up is hard to do". The Guardian. Retrieved March 23, 2011. ^ a b c Brandon Herbel (November 11, 2005). "Panic! At the Disco – Interview". AbsolutePunk. Retrieved March 23, 2011. ^ Emily Zemler (October 3, 2005). "Artist of the Day: Panic! at the Disco". Spin. Retrieved March 20, 2011. ^ James Montgomery (February 2, 2006). "Panic! At The Disco Fight For Cred, Swear They Have No Beef With The Killers". MTV News. Retrieved March 20, 2011. ^ a b c James Montgomery (July 31, 2006). "Panic! At The Disco Carry Emo-Punk Banner Into VMAs With Five Noms". MTV News. Retrieved March 20, 2011. ^ a b c d e f g h i j Chris Payne (September 25, 2015). "Panic! at the Disco's Debut Turns 10: Oral History Told by Brendon Urie, Pete Wentz & More". Billboard. Retrieved September 25, 2015. ^ a b Cathy McCabe (October 5, 2006). "Time to hit panic button". Herald Sun. Australia. Retrieved March 23, 2011. ^ a b Story, Hannah (January 11, 2016). "Panic At The Disco Death Of A Bachelor". theMusic.com.au. Retrieved January 16, 2016. ^ "Panic! at the Disco's Debut Turns 10: Oral History Told by Brendon Urie, Pete Wentz & More". ^ Defending the Maligned. The Essential. Retrieved February 18, 2016. ^ Montgomery, James (March 1, 2016). "40 Greatest Emo Albums of All Time". Rolling Stone. Retrieved March 1, 2016. ^ Death of a Bachelor: Song by Song Review. Strose Chronicle. Retrieved February 18, 2016. ^ http://shu-media.co.uk/music/panic-at-the-disco-album-review/ Panic! at the Disco: Album Review SHUmedia. Retrieved August 12, 2018. ^ "Panic! at the Disco". Spin. October 3, 2005. Retrieved July 12, 2017. ^ Album Review: 'Too Weird to Live, Too Rare to Die!' by Panic! At The Disco. studlife.com. Retrieved May 4, 2015. ^ Collar, Matt (February 2, 2016). "Panic! at the Disco keeps on innovating". Tufts daily. Retrieved December 15, 2017. ^ a b Maria Sherman (September 25, 2015). "Panic! at the Disco Reflects: 'A Fever You Can't Sweat Out' Turns 10". Fuse.com. Retrieved September 25, 2015. ^ "Panic! At The Disco A Fever You Can't Sweat Out Chart History". Billboard. Retrieved January 31, 2019. ^ a b Loftus, Johnny. "A Fever You Can't Sweat Out – Panic! At the Disco". AllMusic. Retrieved April 23, 2011. ^ Diver, Mike (February 15, 2006). "Album Review: Panic! At the Disco – A Fever You Can't Sweat Out". Drowned in Sound. Retrieved April 23, 2011. ^ Endelman, Michael (November 14, 2005). "A Fever You Can't Sweat Out". Entertainment Weekly. Retrieved October 24, 2016. ^ "Panic! at the Disco: A Fever You Can't Sweat Out". Mojo: 112. [U]ltra-sharp lyrics and high-velocity mood and tempo switches make listening as exciting as lugeing down an ice chute with blindfolds on. ^ Mckinlay, Fiona (February 13, 2006). "Panic! At The Disco – A Fever You Can't Sweat Out". MusicOMH. Retrieved April 23, 2011. ^ a b Byrom, Cory D. (November 28, 2005). "Panic! At The Disco: A Fever You Can't Sweat Out". Pitchfork. Retrieved April 23, 2011. ^ Bernard, David (January 23, 2006). "Panic! at the Disco: A Fever You Can't Sweat Out". PopMatters. Retrieved October 24, 2016. ^ a b c Gitlin, Lauren (October 20, 2005). "Panic! at the Disco: A Fever You Can't Sweat Out". Rolling Stone. Archived from the original on July 16, 2006. Retrieved September 26, 2015. ^ Toby, Xavier (February 15, 2006). "Panic! At The Disco – A Fever You Can't Sweat Out". The Skinny. Retrieved April 23, 2011. ^ Passantino, Dom (March 15, 2006). "Panic! At The Disco – A Fever You Can't Sweat Out – Review". Stylus Magazine. Archived from the original on March 4, 2016. Retrieved April 23, 2011. ^ "Kerrang! top albums 2006". Archived from the original on May 26, 2011. Retrieved April 23, 2011. ^ "A Fever You Can't Sweat Out Review". sputnikmusic.com. Retrieved April 23, 2011. ^ "A Fever You Can't Sweat Out TOLLIE Review". gigwise.com. Retrieved April 23, 2011. ^ Poll: Best Video Of The 2000s. MTV. Retrieved June 14, 2015. ^ a b Jonah Bayer; Aaron Burgess; Suzy Exposito; Leor Galil; James Montgomery; Brittany Spanos (March 1, 2016). "40 Greatest Emo Albums of All Time". Rolling Stone. New York City. Retrieved March 1, 2016. ^ "Rock Sound's 101 Modern Classics: The Final Instalment!". Rock Sound Magazine. July 11, 2012. Retrieved July 6, 2015. ^ "The 50 Best Rock Albums Of The 2000s". Kerrang!. February 21, 2016. Retrieved March 1, 2016. ^ James Montgomery (June 12, 2006). "Panic! At The Disco Split Gets Nasty: Band Alleges Wilson Did Not Play On LP". MTV. Retrieved May 6, 2018. ^ James Montgomery (August 9, 2006). "Ex-Panic! At The Disco Bassist Initiates Legal Action Against Band". MTV. Retrieved May 6, 2018. ^ "Panic! at the Disco Concert Setlist at Fillmore Auditorium, Denver on July 22, 2006 - setlist.fm". setlist.fm. ^ "A Fever You Can't Sweat Out – Panic at the Disco". AllMusic. September 27, 2005. Retrieved February 16, 2012. ^ "Australiancharts.com – Panic! at the Disco – A Fever You Can't Sweat Out". Hung Medien. Retrieved April 27, 2015. ^ "Austriancharts.at – Panic! at the Disco – A Fever You Can't Sweat Out" (in German). Hung Medien. Retrieved April 27, 2015. ^ "Ultratop.be – Panic! at the Disco – A Fever You Can't Sweat Out" (in Dutch). Hung Medien. Retrieved April 27, 2015. ^ "Danishcharts.dk – Panic! at the Disco – A Fever You Can't Sweat Out". Hung Medien. Retrieved April 27, 2015. ^ "Dutchcharts.nl – Panic! at the Disco – A Fever You Can't Sweat Out" (in Dutch). Hung Medien. Retrieved April 27, 2015. ^ "Officialcharts.de – Top 100 Longplay". GfK Entertainment Charts. Retrieved April 27, 2015. ^ "GFK Chart-Track Albums: Week 18, 2006". Chart-Track. IRMA. Retrieved April 27, 2015. ^ "Norwegiancharts.com – Panic! at the Disco – A Fever You Can't Sweat Out". Hung Medien. Retrieved April 27, 2015. ^ "Charts.org.nz – Panic! at the Disco – A Fever You Can't Sweat Out". Hung Medien. Retrieved April 27, 2015. ^ "Official Scottish Albums Chart Top 100". Official Charts Company. Retrieved January 31, 2019. ^ "Swedishcharts.com – Panic! at the Disco – A Fever You Can't Sweat Out". Hung Medien. Retrieved April 27, 2015. ^ "Swisscharts.com – Panic! at the Disco – A Fever You Can't Sweat Out". Hung Medien. Retrieved April 27, 2015. ^ "Official Albums Chart Top 100". Official Charts Company. Retrieved January 31, 2019. ^ "Panic at the Disco Chart History (Billboard 200)". Billboard. Retrieved April 27, 2015. ^ "ARIA Charts – Accreditations – 2006 Albums". Australian Recording Industry Association. ^ "Canadian album certifications – Panic! at the Disco – A Fever You Can't Sweat Out". Music Canada. ^ "New Zealand album certifications – Panic! at the Disco – A Fever You Can't Sweat Out". Recorded Music NZ. ^ Jones, Alan (June 29, 2018). "Charts analysis: Greatest Showman set to surpass Adele's record-breaking run at top". Music Week. Retrieved June 30, 2018. ^ "British album certifications – Panic! at the Disco – A Fever You Can't Sweat Out". British Phonographic Industry. Select albums in the Format field. Select Platinum in the Certification field. Type A Fever You Can't Sweat Out in the "Search BPI Awards" field and then press Enter. ^ "American album certifications – Panic at the Disco – A Fever You Can't Sweat Out". Recording Industry Association of America. If necessary, click Advanced, then click Format, then select Album, then click SEARCH.